One of America’s founding myth is that of the “self-made man”: the idea that, with enough work & dedication, anybody can climb the social ladder and become wealthy. Or at least better off than his or her parents. Data shows that the most important drivers of one’s living standard are determined at birth: most of the people who are poor are so because they made the mistake of being born to the wrong parents. Now the goal of this article is not to languish and complain. By providing a fact-based analysis of the unfairness of our society, I aim to foster empathy and gratitude in the reader’s mind. Acknowledging the luck you have is the starting point towards greater generosity and happiness. Let’s dig into the facts. … and it’s getting worse every year. Most of the nation’s economic growth over the past 30 years has gone to the top 0.1%. 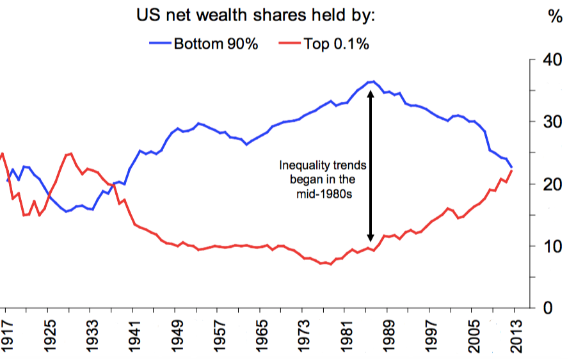 Inequality is now approaching the extreme level that prevailed prior to the Great Depression. 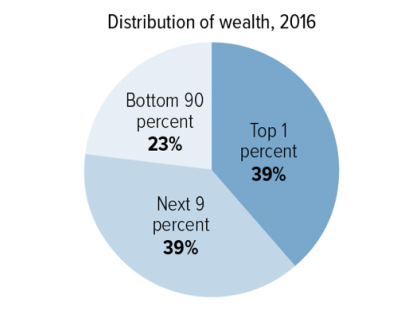 The top 10% households own ~80% of the wealth. We can manipulate numbers and discuss hypotheses as much as we’d like: the reality is staggering. 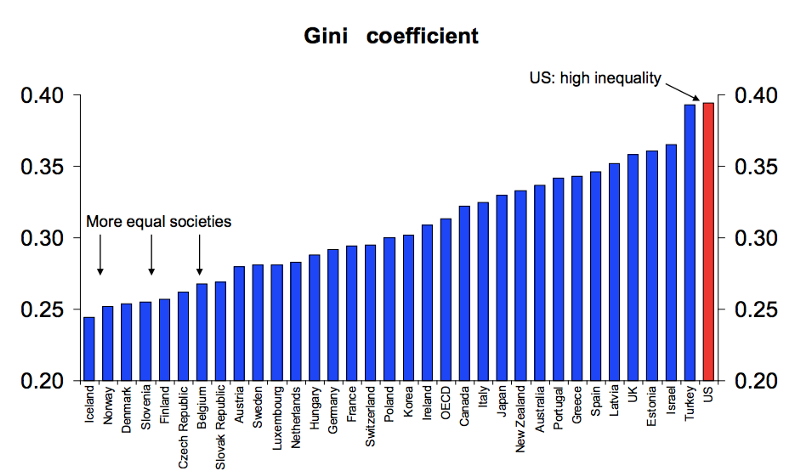 Research centers, in their vast majority and coming from all political backgrounds, have drawn the very same conclusion: the US is — by far — the most unequal society in the developed world. And things are getting worse every year. … and most of us lose. To better understand inequality of opportunity, social scientists and economists have increasingly shifted their attention to intergenerational mobility. By assessing the strength of the association between parents’ and offsprings’ income, we can get an approximation of the possibilities given to each generation on their quest for happiness. So, is social mobility a plausible reality in modern day America? Well, the answer is quite simply: no. According to a research paper by the National Bureau of Economic Research, US social mobility fell by more than 70% in the past half-century. 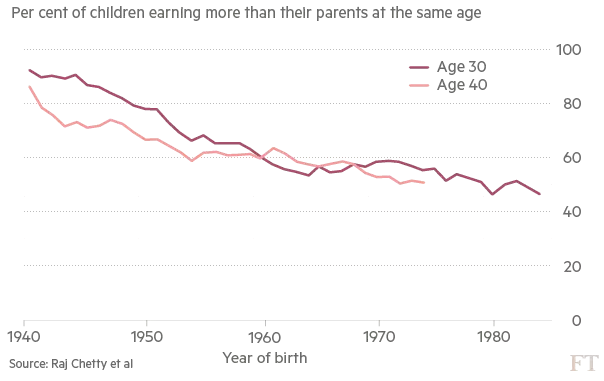 If you feel that it’s getting harder to get ahead, you’re not being delusional: in 2016, about half of 30-year-olds earned less than their parents at the same age. Social mobility is the exception, not the norm. Another way to look at this is to study income growth. Income growth is an interesting metric because it’s a proxy for “better quality of life”: with higher income comes increased purchasing power and better standards of living. So how is the growth of income distributed among the population? 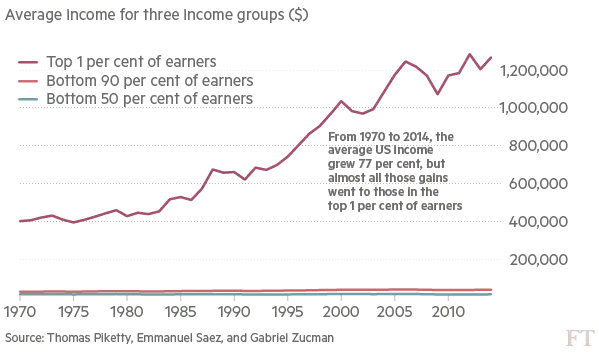 Well since 1979, all of the income gains have been captured by the top 1% and wages have stagnated for everybody else. This is one of the most depressing statistic I’ve ever read: it basically means that most households in the US have not seen any increase in their revenue since 30 years! For the last 40 years, income and wages have stagnated for most Americans. The fact is, wealth is so unevenly distributed that one could argue that the US is a failing democracy: power is entirely held by an elite that’s never renewed and that captures all of the income gains. But what does the 1% think about that? Do they feel empathy and gratitude? Do they recognise their position being — for a great part — the result of luck and unfair advantages? … the wealthier you are, the less empathetic you become. Saying that wealth grants a lot power in today’s capitalistic societies is no great insight. Wealth is what makes you beautiful, what reduces your stress and daily fatigue, what grants you social prestige and education, what gives you time and freedom of choice. Wealth is a big deal. But does wealth affect your behaviour? In other words, do emotional responses and rational thinking change when income increases? A team of scientists from UC Berkeley’s Institute of Personality and Social Research did a serie of fascinating experiments on this topic. They first tried to measure if individuals feel more important than others when put in a position of power. Different groups of three people were brought into a lab. In each group, one person was randomly assigned to be the “leader”. The groups were then given a collaborative writing task. About half an hour into their work, a plate with four cookies was brought: one for each person and one extra. Who took the fourth extra cookie? In almost all cases it was the person who’d been made the leader. And they were more likely to eat with their mouths open and dropping crumbs. It just seems that, when put in a position of power, we tend to be more impulsive and less empathetic. This pattern of increased selfishness has been consistently observed across similar studies. The goal here is to check if there’s a difference in driving behavior between the rich and the poor. The researchers sat at specific crossroads, observing each driver’s attitude as an accomplice appeared on the edge of the curb while cars approached. The results were astonishing: people driving luxury cars like BMWs and Mercedes yielded to pedestrians twice as less as drivers of less expensive cars. They also watched a 4-way stop intersection, noting when drivers cut in front of others when it was not their turn. The results? The more expensive cars were far more likely to jump their turn. This experiment’s objective is to assess wether level of empathy is affected by how powerful the subject considers himself. Subjects sat down in a face-to-face conversation with people who talked about experiences that had caused them suffering. The listeners’ responses were measured 2 ways: first by self-reported levels of compassion and second by electrocardiogram readings to determine the intensity of their emotional response. The participants were also asked to rank themselves on questions measuring personal strengths (“I can get people to listen to what I say”) and weaknesses (“My wishes do not carry much weight’’). That allowed the researchers to place them on a “sense of power” scale. The findings were hugely insightful: participants with a higher sense of power were far more likely to turn a blind eye their partner’s story. More precisely, they “experienced less distress, less compassion and exhibited greater autonomic emotion regulation”. This last study further confirms previous conclusions. Participants were shown images of suffering — kids with cancer, for instance. People with a greater sense of power had less activation of a part of the brain that helps us connect to one another. To put it bluntly, they just seem less sensitive to what others are feeling. Ultimately, it turns out wealth is a very good predictor for unethical behavior and reduced empathy. So what’s happening here? Do you magically become ungrateful & greedy when you buy a new Porsche? What are the psychological mechanisms at play? … the richer you are, the more entitled you feel. One thing’s for sure, the wealthy don’t seem to fully recognise their good fortune. If they did, the level of redistribution would be far greater than what it is and tax cuts wouldn’t be so popular among high income brackets. It also seems that rich and poor largely disagree on factors that lead to success: according to a survey by the Pew Research Center, people with high income are much more likely to attribute success to hard work rather than to factors like luck or being in the right place at the right time. 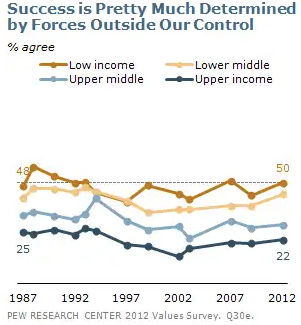 Poor and rich people largely disagree on the factors of success. That’s troubling, because we saw earlier that socio-economic background is the main predictor of an adult’s income and that social mobility is the exception, not the norm. Most behavioral and social scientists know that our brains are fundamentally flawed and that our opinions are not as rational as we might think. Human cognition gives us great insights to why wealthy people tend to underestimate the role of luck in their careers. This term describes our tendency to rationalise unpredictable events. Humans have a natural inclination, after an event has occurred, to see it as having been predictable, despite there having been little or no objective basis for predicting it. Physicians recalling clinical trials, historians describing outcomes of battles, judges trying to attribute responsibility of accidents: examples are numerous. All of a sudden people were telling me I was a born writer. This was absurd. […] What were the odds? - Michael Lewis recalling reactions after the publishing of his 1st book, “Liar’s poker”. This bias operates with particular force for unusually successful outcomes. People don’t like to hear success explained away as luck — especially successful people. As they age and succeed, people feel their success was somehow inevitable. When making decisions or assessing situations, we tend to give a lot of importance to events we immediately recall; thus minimising the role of thing we forgot or never thought about. Under the availability heuristic, people tend to heavily weigh their judgments toward more recent and concrete information. One practical example is that opinions are biased toward the latest news. A successful career is a subtle combination of multiple factors such as talent, capacity of concentration, amount of work, random encounters, family background, mental resilience, living environment, etc. The thing is, some of those factors are more frequent and easier to perceive than others. We’re all vividly aware of how many hours we spend working every day and how dedicated (or not) we are. We can effortlessly recall the last time we pulled an all-nighter to deliver on time and how difficult this hugely-important-but-really-complicated project was. But do you perceive how lucky you are not to have been born in Mozambique? How privileged you are to have a college degree? How improbable was your encounter with your business partner? How blessed you are to be healthy and without handicap? In the construct of our life stories, we unconsciously shrink crucial but abstract factors. Unknowingly, we use mental shortcuts that minor the importance of everything that’s not linked to our close environment. That’s why we tend to largely overestimate the impact we, as individuals, have on our life paths. In an existence led by randomness, humans tend to overemphasise their personal performance because they’re biased towards their own day-to-day experience. A well known cognitive bias is that we recall negative events more frequently and more intensely than positive ones. For example, it’s been proven that we’re usually more upset about losing $50 than we are happy about gaining $50. The same applies to negative feedback, delayed flights, lost games, etc. The effect of those negative experiences is much more powerful than their positive counterparts. From an evolutionary perspective this is justified: survival requires urgent attention to possible bad outcomes (and less urgent to good ones). But in today’s world, it’s a major flaw in our decision-making capabilities. Looking back at our life-choices, we’ll always be more aware of the hurdles and obstacles we faced than of the things that helped us. Think of it as cognitive ungratefulness. … we’re not as great as we think we are. I feel that we’re at a tipping point. Inequalities are at a record high, social mobility is at a record low, and our elite’s moral values don’t seem to converge towards better redistribution or benevolent sharing. The extremely wealthy, besides concentrating the vast majority of assets and income gains of the country, fail to truly recognise the role of luck in their good fortune. This is dangerous because it’s a breeding ground for desperation and hopelessness. When people lose faith in the possibility of improving their condition, when they realise the American Dream has become nothing but a myth, they will resort to extreme means. The subtle combination of political lies, corporate story-telling and public ignorance that has maintained social peace may not last forever. If a tiny minority has all the wealth, if income is stagnating for 9 citizens out of 10, if chances of climbing are minuscule, isn’t rebellion justified?